In this view, the giant orange moon Titan casts a large shadow onto Saturn's north polar hood. Below Titan, near the ring plane and to the left is the moon Mimas, casting a much smaller shadow onto Saturn's equatorial cloud tops. Farther to the left, and off Saturn's disk, are the bright moon Dione and the fainter moon Enceladus. A new Hubble photograph captured a rare alignment of fourof Saturn's moons lining up in front of their planet. The snapshot, taken on Feb. 24 with the NASA/EuropeanSpace Agency (ESA) Hubble Space Telescope, shows the moons transiting in frontof Saturn. The moons, from far left to right, are the white icy moons Enceladusand Dione, the large orange moon Titan, and icy Mimas. Due to the angle of theSun, they are each preceded by their own shadow. These rare moontransits only happen when the tilt of Saturn's ring plane is nearly"edge on" as seen from the Earth. Saturn's rings will be perfectly edgeon to our line of sight on Aug. 10 and Sept. 4, 2009. Unfortunately, Saturnwill be too close to the Sun to be seen by viewers on Earth at that time. This"ring plane crossing" occurs every 14-15 years. 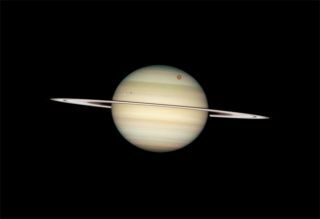 In 1995-96 Hubblewitnessed the previous ring plane crossing, as well as many moon transits, andhelped to discover several new moons of Saturn. Early 2009 was a favorable time for viewers with smalltelescopes to watch moon and shadow transits crossing the face of Saturn.Titan, Saturn's largest moon, crossed Saturn on four separate occasions: Jan.24, Feb. 9, Feb. 24 and March 12, although not all events were visible from alllocations on Earth. Italian Galileo Galilei ? often referred to as the fatherof astronomy ? was the first to observe Saturn through a telescope in 1610.Dutch mathematician and astronomer Christian Huygens discovered Titan in 1655and, 350 years later, the ESA probe named for him touched down on Titan (on Jan.14, 2005), giving the world its first views of the surface of the mysterious,icy world. Giovanni Domenico Cassini, a French/Italian astronomer, discoveredDione (in addition to others) and the German-born Englishman, William Herschel,discovered Mimas and Enceladus. These pictures were taken with Hubble's Wide FieldPlanetary Camera 2 when Saturn was at a distance of roughly 780 million miles (1.25billion kilometers) from Earth. Hubble can see details as small as 190 miles (300kilometers) across on Saturn. The dark band running across the face of theplanet slightly above the rings is the shadow of the rings cast on the planet.